What caused the Mosul ferry to capsize? The Mosul ferry which capsized in the Tigris River leaving dozens dead was a locally-made boat and was not fit for use, yet it was carrying three times its capacity leading to its sinking, according to preliminary investigations. The boat which capsized in the Tigris near Mosul on March 21, 2019 as it was ferrying people were celebrating the start of spring to a nearby recreational site, resulted in the death of at least 100 people including a significant number of women and children. Ali Bayyati, member of the Iraqi High Commission for Human Rights in a statement revealed that the locally-manufactured ferry was out of order and had the capacity to carry 75 passengers, but according to the tickets sold it was transporting as many as 200 people on that day. He added that the dock where passengers were climbing aboard the ferry is also very old and was built in 1979. The ferry is pulled from shore to shore by two thick cables. Zuhair al-A’raji, Mosul district commissioner emphasized that the boat was overloaded; as a result one of the cables broke due to extreme pressure. Video footage posted on social media networks shows the boat tilting left and right, and passengers screaming before it capsized. 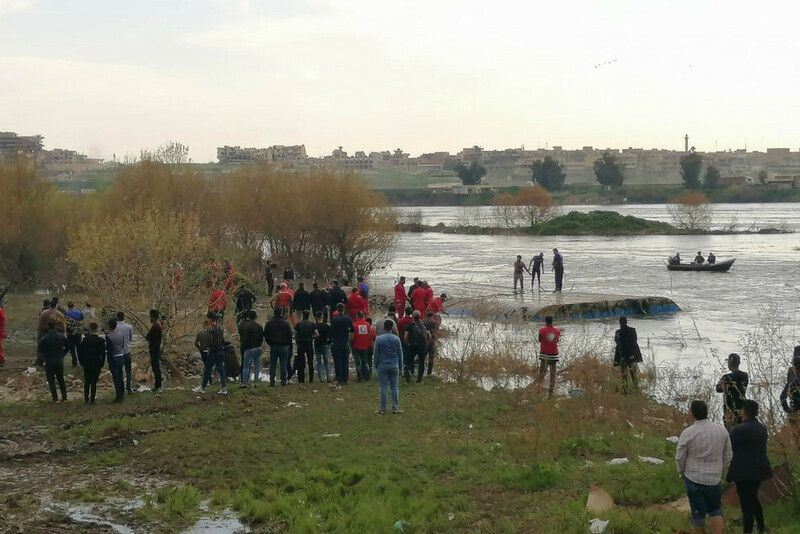 The management board of the Mosul recreational site, in a statement, attributed the accident to the breaking of one of the cables which was connected to a pillar on the river bank. The Umm al-Rabi’ayn recreational project, which is a man-made island, is located in Mosul at the Tigris River bank was reopened for the public in April 2018 following the ouster of the Islamic State (IS) group. The tourist project has been built on an area of 40,000 square meters in Mosul’s Ghabat area. The land allocated for the project is a property of the Iraqi ministry of finance. The Iraqi Tourism Board has declared that the project was not licensed by the boar, calling on the government to shut down all such unlicensed places. The day the ferry sank, the water level on the Tigris was high as the dam floodgates were fully opened. Earlier on February 11, the director of Ninewa’s water resources department formally warned Mosul governor Nawfal Hammadi Sultan of the severe implications of opening the dam’s floodgates on the the residents and the projects built near the river. Mosul district commissioner, in a statement, explained that they have issued warnings to cafeteria owners and other tourist sites including the Umm al-Rabi’ayn Island, indicating that they pledged to commit to the instructions, however the owner of the Umm al-Rabi’ayn Island project violated the instructions. Following the incident, prosecutors ordered the arrest of the project owner along with a number of employees. Brigadier general Hamid Nams, commander of the Ninewa police told Al-Iraqiya news agency that they asked the project owner to suspend their work on March 17, only hours before the water level on the Tigris began to rise, and although he agreed to halt their work like other tourist project owners, he later disobeyed our request. According to latest figures, at least 100 people died in the ferry accident, 80 of them are women and children, 60 people were rescued while search continued for the missing. Many teams sent by the government as well as volunteers have been engaged in the search operations along the Tigris River. Meanwhile, scores of people gathered near the scene of the accident on Friday, March 22 demanding that all those responsible should be held accountable. The Ninewa police chief said that a security committee was formed to investigate into the incident, noting that 16 people have been arrested so far among them the operator of the ferry. Iraqi PM Adil Abdul-Mahdi in a letter asked the parliament to sack Ninewa governor accusing him of negligence and corruption. Earlier, he had ordered the formation of a crisis management cell in Ninewa which included the president of Mosul University, commander of Ninewa operations and Ninewa police chief. Ali Bayyati, member of the Iraqi High Commission for Human Rights said they intend to file a lawsuit against the governor through the attorney-general. The Mosul disaster occurred as the war ravaged city which was under IS control between 2014 to 2017 still suffers lack of essential services and devastated infrastructure, while thousands of its residents who were displaced during the war are unable to return home.